Everyone’s talking about the recent White House Correspondent’s Dinner. And while POTUS was not in attendance, the correspondents who keep the White House in check made sure not to miss it. Today’s World Press Freedom Day. This year marks its 25th celebration, with the main event happening in Accra, Ghana. The theme this year, Keeping Power in Check: Media, Justice and The Rule of Law, covers issues of media and the transparency of the political process, the independence and media literacy of the judicial system, and accountability of state institutions toward the public. Journalists play a critical role in holding governments and institutions accountable. In a free society, transparency is especially important in the political process because the public relies on news media to inform on issues affecting them and provide critical reporting. 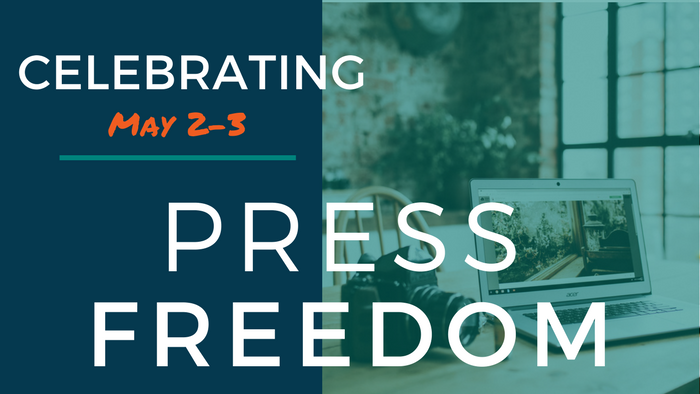 Coinciding with World Press Freedom Day is the release of Reporters Without Borders’ (RSF) 2018 World Press Freedom Index. Based on the level of freedom available to journalists, the index provides a ranking of 180 countries. 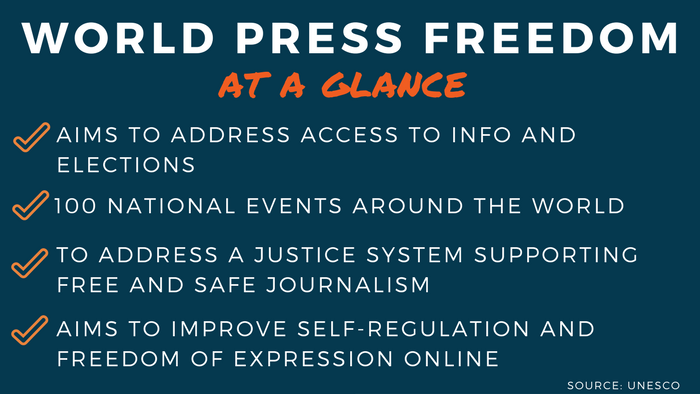 In an ideal world, journalists should be able to report without fear of censorship or retribution. Regardless of clear and present danger, journalists continue to fight the good fight. While reporting on the political process in Malta (ranking No. 65 on the index), Maltese reporter Daphne Caruana Galizia was killed by a car bomb outside her home. Her death led to the creation of The Daphne Project, which consists of a group of 45 journalists from 18 organizations representing 15 countries who are picking up the work she left behind. The Guardian recently wrote a piece about The Daphne Project: A Milestone in the Fight to Defend Press Freedom. Down two spots from 2017, the U.S. ranks No. 45 for world press freedom. The ranking should come as no surprise, as U.S. news media increasingly has experienced hostility over the past several years, particularly after the 2016 presidential election. According to RSF, this mainly is due to President Donald Trump’s attack on the free press. Read up on America’s role in a ‘climate of hatred’ for journalists on Columbia Journalism Review. Most surprising with the new RSF rankings might be the decline of press freedom in Europe. The United Kingdom, falling 18 places since 2002, remained at No. 40, one of the worst in Western Europe. One of the primary reasons have been new media laws in the UK which have aided in creating a hostile climate toward journalists. In Myanmar, journalists face violence and threats in their commitment to hold institutions accountable. Myanmar ranks No. 137. It’s been reported that two Reuters reporters have been accused of possessing secret government papers and have been arrested, potentially facing 14 years in prison. Ranking at No. 138 (down two spots), India Prime Minister Narendra Modi is using prosecutions to gag journalists who are overly critical of the government. According to RSF, no journalists have been convicted, but the threat encourages self-censorship. This year’s UNESCO/Guillermo Cano World Press Freedom Prize is being awarded to Mahmoud Abu Zeid, also known as Shawkan, an Egyptian photojournalist. Shawkan was arrested while covering a demonstration at Rabaa Al-Adawiya Square in Cairo and has been in jail since 2013. Anne Thomas is a manager of customer content services with PR Newswire. Follow her on Instagram @anniepallam or connect on LinkedIn. ← Looking for a little inspiration? Follow these photographers on Instagram.